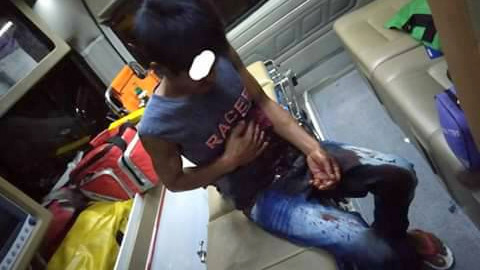 PHUKET: Police are looking for a man who robbed and stabbed a Myanmar national as he was walking along a street near Phuket Bus Terminal 2 on Tuesday (Jan 15). Tin Hiwe, 39, explained to police that he was walking in front of a Family Mart store on Soi Pathnee at about 9:15pm when he was approached by a young man on a motorbike who asked him if he needed a ride. When Mr Tin refused, the man got off his bike and stabbed him below the chest before making off with his phone. People nearby went to help Mr Tin when they saw him bleeding from the wound and called the 191 national emergency hotline. Police and Kusoldharm Foundation rescue volunteers arrived at the scene to find Mr Tin wounded but conscious and they took to Vachira Hospital Phuket in Phuket Town. Col Sompong Thipapakul of the Phuket City Police said that an investigation has been launched to find the suspect as witnesses are being questioned and CCTV is being inspected.